The European Union is making “a grave mistake” by opening a diplomatic office in Iran, Israel’s Foreign Ministry said on July 14. 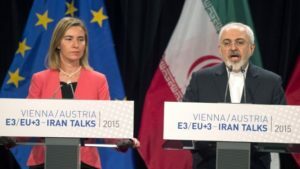 EU Foreign policy head Federica Mogherini had earlier on July 14 announced plans for a mission in the Islamic Republic in a statement marking one year since the signing of the nuclear deal. Israel cited Iran’s continued support on terror and human rights violations in calling on the Eu to rethink the move. “The European Union supports a strategy of gradual engagement that is comprehensive in scope, cooperative where there is mutual interest, critical when there are differences and constructive in practice,” she said. Iran has signaled frustration that the lifting of sanctions after the nuclear deal has not yet let to significant investments as many international investors and banks are still wary of doing business with the Islamic Republic.